The LuxCraft Rollback Bench adds charm and beauty to your outdoor garden, patio or porch. Nothing is quite as relaxing as some time outside on a cool evening or a weekend morning with your favorite mug of coffee. Here is the right seating option for your time outdoors. The LuxCraft Rollback Bench provides room for family and friends to sit and chat, read and rest. Enjoy your flower garden all the more with this decorative Amish bench placed nearby. Pose for family photos or create a special spot for kids to enjoy their popsicles outside. 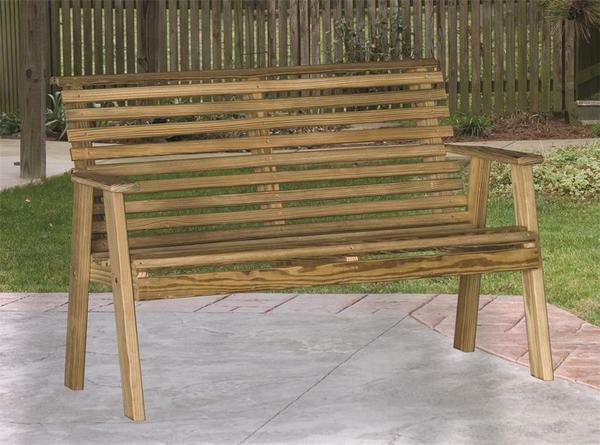 Be sure to review our line of Amish Outdoor Porch Rockers to accompany this bench. Your Amish bench is made of pressure treated kiln dried yellow pine with a focus on durability and longevity. This yellow pine wood is micro pressure treated and air dried to protect it against cracking, warping, insects, and decay. Dedicate this Amish bench to someone special or commemorate an important date in your family history. Simply select the personalization option and one of our Amish Furniture Specialists will call to discuss what you'd like to see engraved on your bench. Choose your favorite stain option and add a splash of color with your choice of seat cushions or pillows.